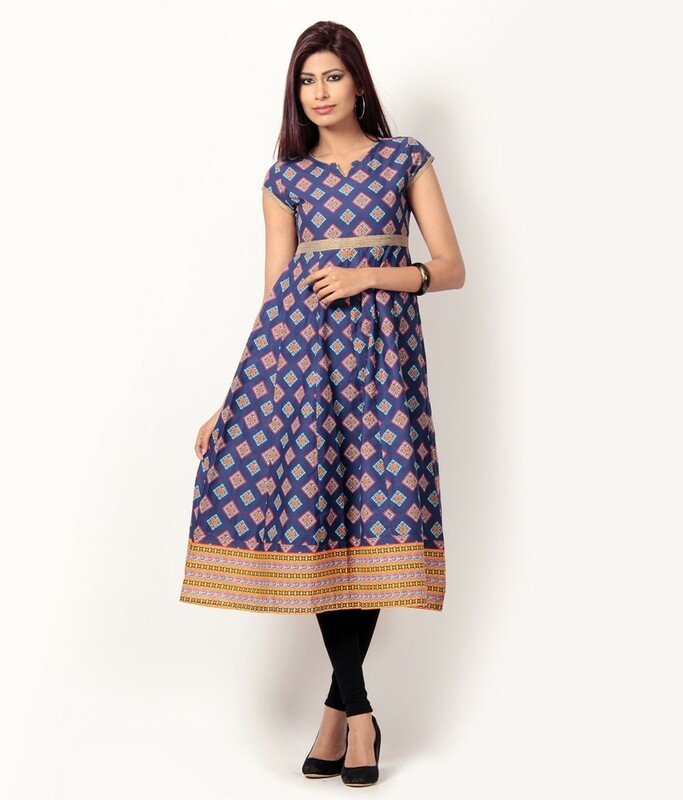 Kurtis is one of those ethnic wear apparel that you can wear as a casual wear and a party wear as well. Women wear it on functions, different occasions, daily to their work place and college, on ceremonies and even as dress for events like dramas, plays, etc when they have to perform. Since it is so popular among women, they must know about all the variety they can get in Kurtis. Obviously, you don’t want to wear the same Kurti design for the rest of your life. Women love variety. That’s why we have now come up with this article to make women and girls, the admirers of ethnic wear, familiar about this ethnic wear. So, let’s see what all different kinds of kurti designs you can wear daily and occasionally. 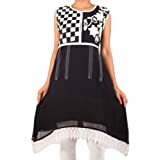 Frock Kurti can be worn as Daily Wear, Casual Wear or for college if paired up with Scarf, boots choker, tight leggings, 3/4th leggings or no bottom and accessorized with either top, jhumkas, bangles, headbands or nothing. A line kurtis is best for casual wear and can be worn with Leggings, Churidar, Jeggings, Salwar, Jeans, etc. You can pair it up with Light and not too heavy jhumkas, elegant watch and flats for a more elegant look. These kinds of kurtis are best for women with Apple shape body and Pear shape body. 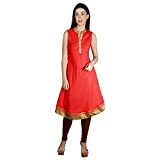 Anarkali Kurti is for daily wear, work place like your office, PTMs, weddings, wedding related functions and festivals like Diwali. For a festive look, you can pair it up with Ethnic jewelry, flats, Over coat, Kolapuri chappals, Indian Juti, Jhumkas and clutch. The go best when worn with body fitted bottoms like : Leggings or Churidar and are an awesome choice for women with Rectangle shape body, Apple shape body, Pear shape body, Hour-glass shape body. Trail Cut Kurtis are best for occasions like mehendi, night functions, weddings, dinner, casuals and dates. You can even wear them without bottoms as a dress or otherwise with treggings, jeggings and skinny jeans. Accessories like modern decent jewelry, Pencil heels or any other heels and a clutch look best with this kind of kurti. Flared kurtis look very pretty and can be worn on occasions and as well as casual wear. Skin-tight leggings look best with them but you can also wear it without any bottoms as a dress for a modern look. It looks good without any accessories as a casual wear. If you want, you can wear thin strap watch and high heels with it for an evening look. 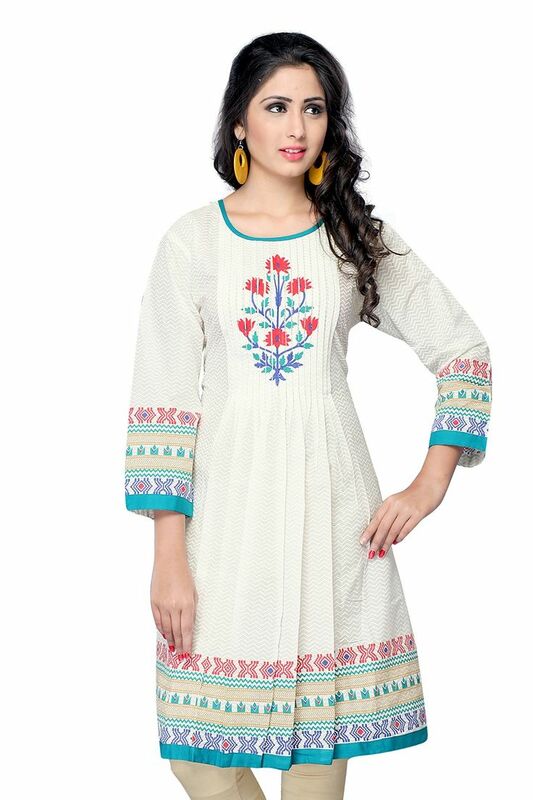 Angrakha Kurti are a great choice for work, daily wear, casual (cotton), party wear (silk, georgette, chiffon, net and chanderi), and mehendi type small family functions. : Churidar, leggings of full length and palazzo look amazing with this type of kurti. For an evening look, you can wear long classy earrings and otherwise, jhumkas and a clutch for any small event and casual wear. It’s probably the best choice for you if your body type is Apple shape body, Pear shape body, Rectangle Shape body and Hour-glass shape body. This is a really nice collection of kurti designs, Specially A-line kurti is an amazing one. Thanks for posting this. Nice Blog….Thanks for sharing with us……. This is a really nice collection of Kurti designs. Angrakha Kurti awesome .Thanks for posting this blog. Kurti design is very nice ….